Crushing Krisis presents a definitive guide on every Valiant Entertainment title from their 2012 universe reboot and how they can be read via hardcover and trade paperback graphic novels. Last updated May 2016 with titles scheduled for release through October 2016. Valiant Comics has one of the most interesting origin stories in the business. The company was originally founded in the late 80s by Marvel’s longtime Editor-in-Chief, Jim Shooter, and a crowd of entertainment industry veterans. Their initial titles were actually licensed Nintendo character comics, including a Super-Mario, Zelda, Metroid, and comic called Game Boy – no joke! A year later they brought back Gold Key Comics characters from the dawn of the Silver Age, like Magnus Robot Fighter and Solar, Man of the Atom. It was in 1992 that Valiant launched their own, original line of superheroes, starting with a core of four interconnected titles: Harbinger, X-O Manowar, Rai, and Shadowman. In the height of the comic market and the heat of speculation craze, Valiant was a massive hit alongside renegade start-up Image. Their books soared in back-market value, and they added more heroes to the line. The success was short-lived. In 1994 the company solid to video game company Acclaim Entertainment. Acclaim did great service to Valiant by getting their intellectual property into mass market video games, giving characters like Shadowman and X-O Manowar exposure factorially larger than they had in comic shops. However, in two more years the comic line was shuttered and relaunched, to ever-dwindling returns before finally petered out in 2000. How did they come back? A long slog from acquiring the rights to the original Valiant characters in 2005 to the re-debut of X-O Manowar in 2012 to critical accolades. Having learned from past over-extension, Valiant’s comeback has been deliberately paced with a focus on big-name creators, consistent interconnected stories, and strong artwork. They also published some beautiful collected editions, in both paperback and deluxe hardcover. For a wonderful narrative history of the above, check out this excellently sourced article! 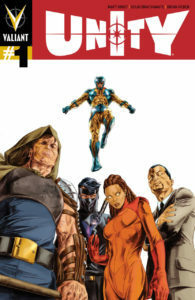 This guide lists the collected editions for title from Valiant’s 2012 reboot forward in the order of each title’s debut. In the case of titles where the narrative leaps to or from another book, I’ve listed the connection. Current ongoing titles are bolded. Parenthetical titles are additive limited series or events. See also the full glossary of titles at the bottom of the page. X-O Manowar is a fifth-century Visigoth who was abducted from battle against Rome by aliens. When he escapes with their holy suit of armor, he finds himself on present day earth! X-O Manowar is Valiant’s marque hero, like an Iron Man or Batman (only not rich). He’s a regular player in most company-wide crossovers and events. Also collects X-O Manowar: Commander Trill #0 and X-O Manowar: Valiant 25th Anniversary Special #1. Also collects Armor Hunters #1-4. See Armor Hunters, below. 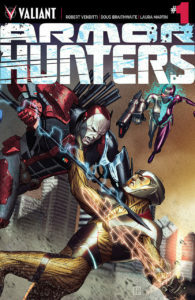 Harbingers are Valiant’s version of Mutants, humans with incredible power named for the Harbinger Foundation of founder and mega-power Toyo Harada. The series follows the emergence of a young Harbinger named Peter Stanchek. 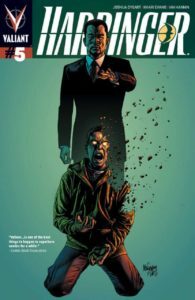 Harbinger ended with #25 in July 2014. It continues to Harbinger: Bleeding Monk, below. See also Harbinger Wars, below. #25: ? Not solicited as part of Vol. 5, but internet guides list it with that collection. Bloodshot is effectively Valiant’s Wolverine or Deadpool, a hardened solder who experiments granted regenerative powers (fueled by nanotechnology) and major memory issues. Bloodshot’s title changed to Bloodshot and H.A.R.D. Corps with issue #14 in August 2014 and returned to Bloodshoot with #24 in October 2014; they are all listed here. 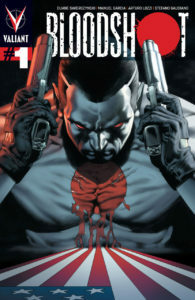 Bloodshot ended with #25 in November 2014 and continues to The Valiant, below. Archer & Armstrong pairs an ancient Sumerian with eternal life granted by a mysterious artifact called “The Boon” with the young assassin sworn swore to destroy it, Obadiah Archer. Obviously, hijinks ensue – after all, this is a buddy book! Archer and Armstrong ended with #25 in October 2014 and continues to The Delinquents, below. Collects Archer & Armstrong #14-25, Archer & Armstrong: Archer #0, and Bloodshot and H.A.R.D. Corps #20-21. It should also include “The One Percent” based on the TPB collections, but I cannot confirm that. Shadowman is the story of Jack Boniface, who adopts his father’s legacy to defend New Orleans and the world against supernatural creatures of the night. Shadowman ended with #16 in March 2014. It continues to Shadowman End Times, below. Collects Shadowman #11–16, Shadowman #13X, Shadowman: End Times #1–3, and Punk Mambo #0. A pair of estranged adoptive brothers come together to investigate their father’s death and accidentally gain amazing powers – but if they don’t make contact once every 24 hours they’ll dissolve into nothingness. A tongue-in-cheek, humorous title. 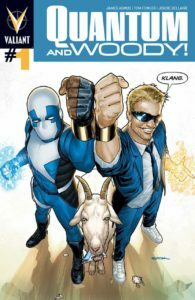 Quantum & Woody ended with #12 in July 2014. It continues to The Delinquents and Quantum and Woody Must Die, both below. Eternal Warrior is Gilad, the brother of Armstrong, long since thought dead. It’s his lifelong task to defend the Geomancer of each generation against Nergal, a god of death – yet, it seems Gilad is destined to lose that battle every time. Eternal Warrior ended with #8 in April 2014. It continues to Unity starting with #6 and then to Eternal Warrior: Days of Steel and The Valiant, below. In deluxe oversized hardcovers… which aren’t solicited yet! Named for Valiant’s classic 1992 crossover, in the new Valiant Unity it is a globe-spanning team with a core membership of X-O Manowar, Ninjak, and a Harbinger named Livewire. 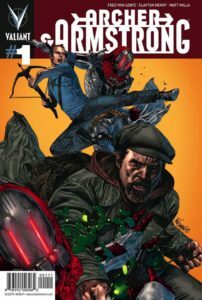 #0: See Archer & Armstrong, above. #0: See Harbinger: Omegas, below. This includes both the core Armor Hunters mini-series and the Harbinger and Bloodshot minis. A mini-series that continues both Archer and Armstrong and Quantum and Woody. Continued in The Death-Defying Doctor Mirage: Second Lives, below. Collects The Death-Defying Doctor Mirage #1-5, The Death-Defying Doctor Mirage: Second Lives #1-4, and material from The Death-Defying Doctor Mirage #1 Plus Edition. #1: See Archer and Armstrong, above. An event series starring The Geomancer, Eternal Warrior, Bloodshot, and Ninjak, amongst others. Ivar is the third sibling of Armstrong and Eternal Warrior. Continued from Harbinger: Omegas, above. May also collect the serialized Imperium: Prelude from Ivar, Timewalker #1, Divinity #1, Imperium #1, Ninjak #1, and Bloodshot Reborn #1. Continued from The Valiant, above. Collects Book of Death: Fall one-shots from Harbinger (2015), Ninjak (2015), X-O Manowar, and Bloodshot (2015). Book of Death: Legends of the Geomancer #1-4: Released as a comic-only incentive that will not be released in digital or trade paperback form. 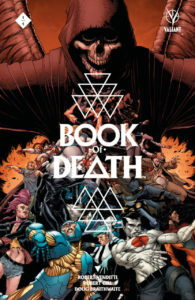 Collects Book Of Death #1–4, Book Of Death: The Fall Of Bloodshot #1, Book Of Death: The Fall Of Ninjak #1, Book Of Death: The Fall Of Harbinger #1, and Book Of Death: The Fall Of X-O Manowar #1. 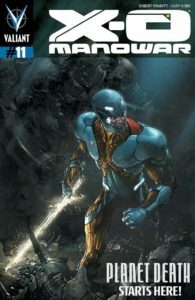 #0: See X-O Manowar, above. Continued from Doctor Mirage, above. So far this event includes 4001 A.D. (2016) #1, 4001 A.D.: X-O Manowar (2016) #1, Rai (2014) #13, and Valiant: 4001 A.D. FCBD Special (2016). Events: 2013: Harbinger Wars, 2014: Armor Hunters & The Valiant, 2015: Book of Death, 2016: 4001 A.D.
2016: Faith, Divinity II, 4001 A.D.
Harbinger #0 – between Harbinger 8 & 9. 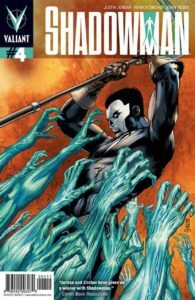 Shadowman #0 – between Shadowman 6 & 7. Archer & Armstrong #0 – between Archer & Armstrong #9 – 10.